✅SUPER EASY INSTALL Adapter instantly cleans up your media center. Designed specifically for the TV Sticks, providing consistent power to keep your Streaming Media Player running at maximum performance. ✅UNIVERSALLY COMPATIBLE | Works with ALL streaming HDMI devices... Roku models, Chrome & more streaming media players and devices. ✅DECLUTTERS TV CABLES | Instantly provides a fresh wireless media center setup! Get yours Wireless Cord now. ✅MONEY BACK GUARANTEE | If you aren't completely satisfied or find (in rare cases) is not compatible with your TV, we will buy it back for a complete FULL refund! Add to cart & get your Wireless Cable Now! PLEASE NOTE: only Fire Cable branded goods will be honored by our guarantee and after-sales service. If you receive a unit without the Fire Cable logo, you should consider it counterfeit and return it immediately. 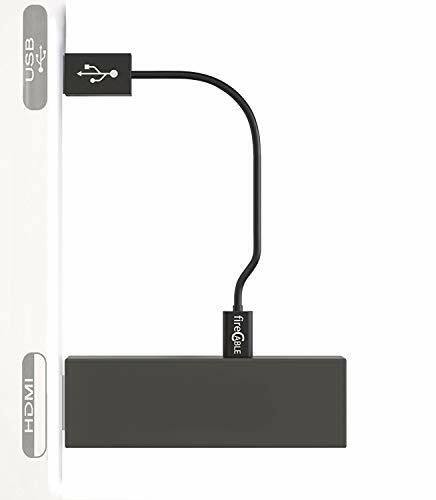 fireCable Plus - Powers Streaming Sticks (Firestick and Other HDMI Streaming Players) Directly from Your Flat Screen TVs USB Port. Eliminate The Need for an AC Outlet.